Removing vinyl wallpaper is more challenging than removing plain wallpaper because steam can’t penetrate the surface layer. Another problem often faced is the incorrect installation of the wallpaper. If the person who installed the wallpaper didn’t know that they had to prime the drywall before installing the wallpaper, the job will be far more difficult. Fortunately, many vinyl wallpapers are “strippable.” That means the surface layer can be pulled away to expose the paper layer. Removing the paper is as simple as prying up a corner and pulling at a 10 to 15-degree angle. Often the vinyl wallpaper has a grain. The paper will pull away easily in one direction and tear in the opposite direction. If you are having trouble removing the vinyl from the top, try working from the bottom up. It may work better. If the wallpaper isn’t strippable, you’ll need to score it so that wallpaper stripper or steam can get behind the paper and soften the adhesive. 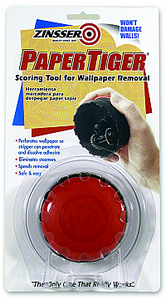 Zinsser’s Paper Tiger wallpaper scoring tools is useful as it doesn’t damage drywall or plaster. The main disadvantage is that the wallpaper will come up in tiny strips. So only use this tool if the method suggested already doesn’t work. If the vinyl has been exposed to heat or very cold conditions, it may tear off in pieces. If this happens, use a flat putty knife to get under the torn area so you can grip the wallpaper again. You’ll find that working patiently will reduce the number of tears. The remaining paper layer can be removed easily once it is wet. Usually plain warm water is enough to loosen it. If this doesn’t work try the wallpaper remover or make your own wallpaper remover. Once you have the wall exposed, you’ll be able to tell whether the wallpaper was applied over drywall or over plaster. 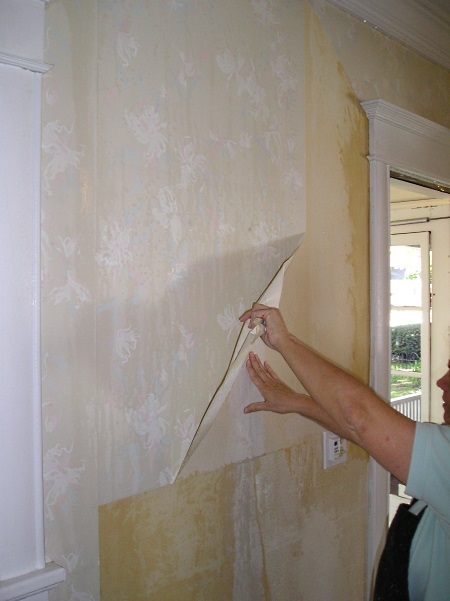 Removing wallpaper from plaster is actually easier as plaster is more resistant to water. Drywall has been the standard since the 1970s. You have to work carefully as you remove the paper and glue, because the paper layer of the drywall is vulnerable. If you use too much water, you could ruin the integrity of the paper and cause the gypsum layer to expand. You don’t want to nick or gouge the paper layer of drywall if you can avoid it. This leads to time wasting repairs. Fortunately, if you do nick the wall, you can use spackling compound to fill in the nicks. After the patch has dried, you will need to sand the surface smooth with a drywall sanding block. Then you’ll want to prime the entire wall with acrylic-latex primer. If you discover that the walls have been damaged severely (often the reason wallpaper was applied in the first place), you’ll need to skim-coat the wall with drywall compound before painting. Doing this so the wall is perfectly smooth is a challenging task. You may want to consider texturing the wall to cover up the imperfections after you’ve made the basic repairs. Of course, it’s very important to remove all traces of glue before priming and painting the wall. Removing the raining glue can be a challenge. 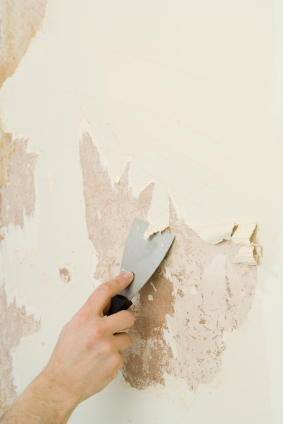 Check out this article for more ideas about removing stubborn wallpaper glue. If there’s a lot of remaining glue you will need to use either an oil base primer, like Kilz, or a shellac primer. A water-based primer could react with the remaining glue causing bubbling or loss of adhesion.